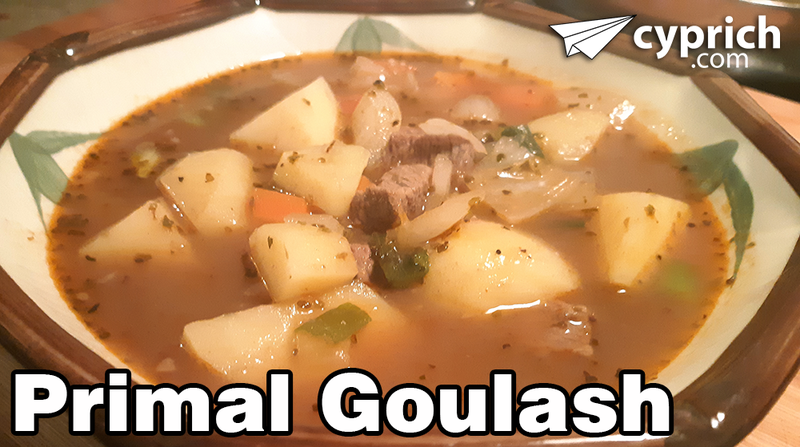 Eat goulash like your paleo ancestors did! This is a favourite comfort food from my Slovak childhood with a few modifications to make it paleo friendly. Bring beef cubes in water to boil. After boil, lower heat to simmer and cook for 2 hours to make make beef tender. Cook for for less time (i.e. 30 min) if your in a hurry. Add caraway seeds, paprika, marjoram, salt, pepper, and tomato paste to soup. Cut green onions to small strips and add to soup. Cut potatoes to cubes and add to soup. Increase temperature to medium and cook for 30 minutes. Crush or finely dice garlic cloves. In a frying pan, fry garlic in oil for 1 minute. Add diced large onions with paprika and fry until caramelized for about 3 minutes. Add contents to soup, and its ready to serve.